On October 19, 2014, comet C/2013 A1 (Siding Spring) traveled from the most distant region of our solar system, called the Oort Cloud, and made a close approach, within about 87,000 miles (or 139,500 km) of the Red Planet. This is less than half the distance between Earth and our moon and less than one-tenth the distance of any known comet flyby of Earth. The ‪#‎MAVEN‬ spacecraft, which only arrived at ‪#‎Mars‬ a month earlier, detected the comet encounter in two ways. The remote-sensing Imaging UltraViolet Spectrograph (IUVS) observed intense ultraviolet emission from magnesium and iron ions high in the atmosphere in the aftermath of the meteor shower. Not even the most intense meteor storms on Earth have produced as strong a response as this one. The emission dominated Mars’ ultraviolet spectrum for several hours after the encounter and then dissipated over the next two days. 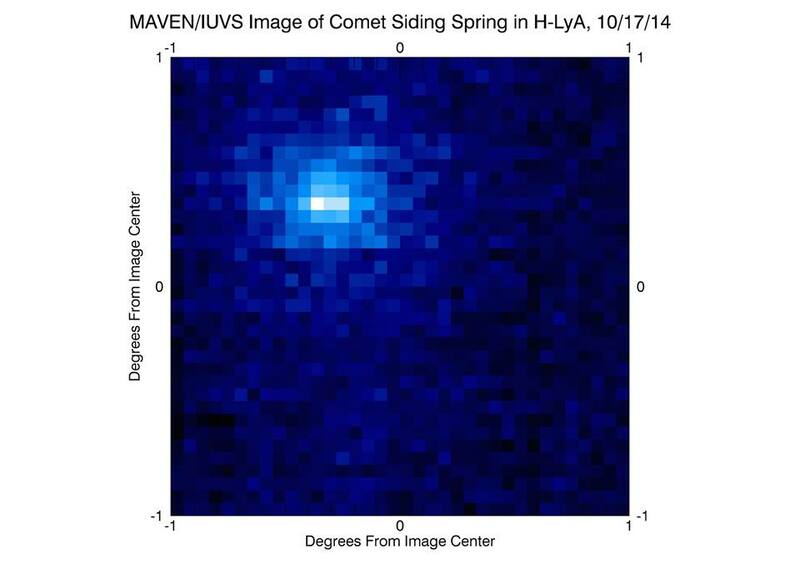 In the image above, the MAVEN spacecraft obtained an ultraviolet image of hydrogen surrounding comet Siding Spring on Friday, October 17th, two days before the comet’s closest approach to Mars. The Imaging Ultraviolet Spectrograph (IUVS) instrument imaged the comet at a distance of 5.3 million miles (8.5 million kilometers). The image shows sunlight that has been scattered by atomic hydrogen, and is shown as blue in this false-color representation. Comets are surrounded by a huge cloud of atomic hydrogen because water (H2O) vaporizes from the icy nucleus, and solar ultraviolet light breaks it apart into hydrogen and oxygen. Hydrogen atoms scatter solar ultraviolet light, and it was this light that was imaged by the IUVS. Two observations were combined to create this image, after removing the foreground signal that results from sunlight being scattered from hydrogen surrounding Mars. The bulk of the scattered sunlight shows a cloud that was about a half degree across on the “sky” background, comparable in size to the Earth’s Moon as seen from Earth. Hydrogen was detected to as far as 93,000 miles (150,000 kilometers) away from the comet’s nucleus. The distance is comparable to the distance of the comet from Mars at its closest approach. Gas from the comet is likely to have hit Mars, and would have done so at a speed of 125,000 miles per hour (56 kilometers/second). This gas may have disturbed the Mars atmosphere. MAVEN also was able to directly sample and determine the composition of some of the comet dust in Mars’ atmosphere. Analysis of these samples by the spacecraft’s Neutral Gas and Ion Mass Spectrometer (NGIMS) detected eight different types of metal ions, including sodium, magnesium and iron. These are the first direct measurements of the composition of dust from an Oort Cloud comet. The Oort Cloud, well beyond the outer-most planets that surround our sun, is a spherical region of icy objects believed to be material left over from the formation of the solar system. ← MAVEN has been in orbit around Mars for one Earth year!